An exhibit at BAMPFA shows how relevant the late artist continues to be. The moment you step inside the gallery at BAMPFA where Theresa Hak Kyung Cha's work is being exhibited, you hear a voice. It fades in and out, faintly echoing through the space like an otherworldly presence trying to communicate. If you follow the exhibit in the clockwise direction it was intended to be experienced, you do not discover the source of this sound — the artist's voice, overlapping, sometimes speaking in English, sometimes in Korean or in French, emanating from a three-video installation called Passages Paysages — until about halfway through. But in many ways, this auditory backdrop perfectly encapsulates the experience of Cha's work and provides an entry into her rich artistic vision. For the BAMPFA exhibition, "Avant Dictee," assistant curator Stephanie Cannizzo arranged the works around Dictee, organizing sections according to the ten chapters in the book, nine of which were named after the Greek muses. The majority of the work was made in the 1970s during Cha's time as a student at UC Berkeley, and echoes themes explored in the book. While those who are unfamiliar with Dictee may be at a disadvantage in grasping Cha's multitude of concepts, there is still much to glean from her work. Cha was born in Busan, South Korea, in 1951, six years after the country emerged from Japanese colonial rule and in the midst of the Korean War. In 1962, her family emigrated to the United States via Hawaii and eventually settled in San Francisco, where Cha attended a Catholic high school and learned French. Her experience being an outsider forced to learn English, and later studying French, had a profound impact on her, and she connected this to her parents' own painful experience of being forbidden to speak Korean under Japanese rule. "The main body of my work is with Language, 'looking for the roots of the language before it is born on the tip of the tongue,'" Cha wrote in a statement that is displayed in the exhibit. We see this concept explored quite literally in the black-and-white video Mouth to Mouth, which looks like static until a fuzzy dark image faintly emerges into view — a mouth opening and closing like a whale shark's. It utters no words; instead, you hear the sound of trickling water and chirping birds. The video seems to correspond to a passage in the beginning of Dictee: "She mimics the speaking. That might resemble speech. (Anything at all.) Bared noise, groan, bits torn from words. Since she hesitates to measure the accuracy, she resorts to mimicking gestures with the mouth." 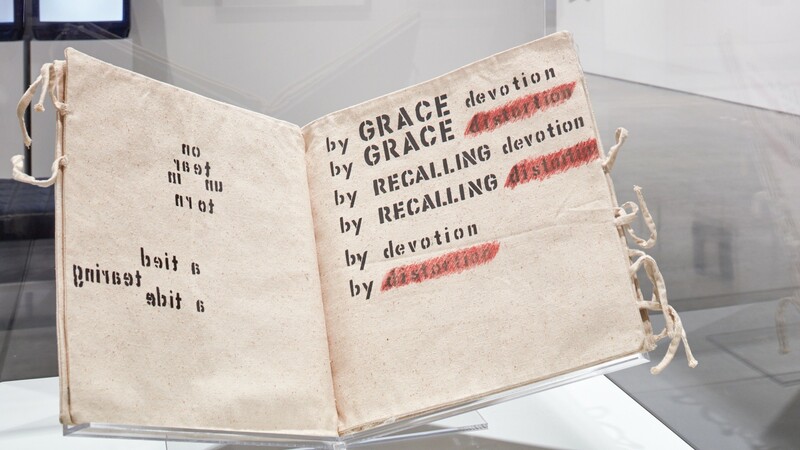 Cha is clearly playing with words in Repetitive Pattern, a mixed-media piece that consists of cloth with the words "Repetitive" and "Pattern" repeated, sometimes in all caps, sometimes lowercase, in varying sizes. She also plays with the words "One" and "Another," sometimes breaking them up, sometimes putting them together, and physically bending the letters to match the shapes of tai chi symbols. The repetition with slight variations is reminiscent of a rhythmic improvisation or a Buddhist monk's chant. Several black-and-white photographs of Cha's performance art are also on display. In Aveugle Voix, performed in San Francisco in 1975, Cha, dressed in all white (the color of mourning in Korea), wrapped a strip of cloth with the French words aveugle (which means "blind") over her mouth and voix (meaning "voice") over her eyes. In swapping these words with the corresponding body parts they refer to, Cha again toys with words, as well as concepts of agency. Indeed, her work is deeply personal. For Chronology, Cha photocopied old portraits of her family and then overlapped some of the images on top of each other. Around the images are words, like fragments of a poem, exploring issues of time and lineage. Although her work is quiet and minimalist in nature, there is also a deep sense of urgency and pain infused within. In Tongue Tied, Cha carefully typed text onto cloth, at times ascending and descending diagonally, which adds another dimension of meaning. In one part, "physically" is repeated on top of each other in a solid paragraph, with the phrases "IF HEART," "IF SOUL," "IF BODY" in bold overlaid on top. Cannizzo ties this piece to a passage in Dictee in which Cha writes about how her mother risked death by speaking her mother tongue — in other words, her tongue was literally tied. Sadly, Cha's own voice was tragically cut short when she was raped and murdered in 1982 — the same year Dictee was published.